The Lost Millennium is a Booster Pack in the Yu-Gi-Oh! Official Card Game (OCG) and the Yu-Gi-Oh! Trading Card Game (TCG). It is the fourth Booster Pack in the OCG Series 4. This set has been released in the TCG in English, French, German, Italian, Portuguese and Spanish and in the OCG in Japanese, Asian-English and Korean. Its main focuses are on Rock-Type monsters and the archetype "Elemental HERO", capitalized "Elemental Hero" at the time. 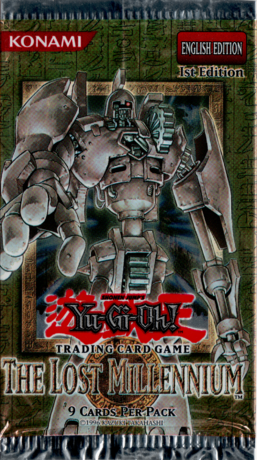 It also introduced several cards used in the Yu-Gi-Oh! GX series. The set was also released in The Lost Millennium: Special Edition. This is one of the four Booster Packs combined into Dark Revelation Volume 3. In the Japanese version of this set, each pack contains 5 cards and each box contains 30 packs. In the TCG and Asian-English, version each pack contains 9 cards and each box contains 24 packs. In the Korean version, each pack contains 5 cards. This page was last edited on 13 March 2019, at 13:39.